Can you believe this frass? The Hoosier Gardener, perhaps knowing that I like to use the word frass as my own secret gardener's cuss word, sent me this picture of a bag of frass. Insect frass in a bag. Can you imagine? How in the world does a company get enough frass to fill not just one bag, but enough bags to market and sell it as plant food? Who came up with the idea of collecting insect poo and using it as fertilizer, anyway? In all my wildest gardening dreams, which include dreams of someone delivering and spreading a wonderful well-composted, odor free load of manure on my garden, I never dreamed of collecting insect frass for fertilizer. By the way, don't dish the manure as fertilizer. One of my uncles uses horse manure on his garden and it makes quite a bit of difference, as noted in this picture from his garden a few summer's ago. 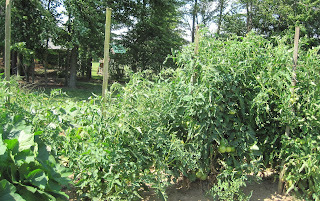 For the tomatoes on the right, the big tall ones, he added composted horse manure to the hole before he planted. He ran out before he planted the ones on the left, the puny little ones. See the difference? Anyway, I wonder what what kinds of insects they get the frass from and how many insects it takes to fill a bag full of frass. 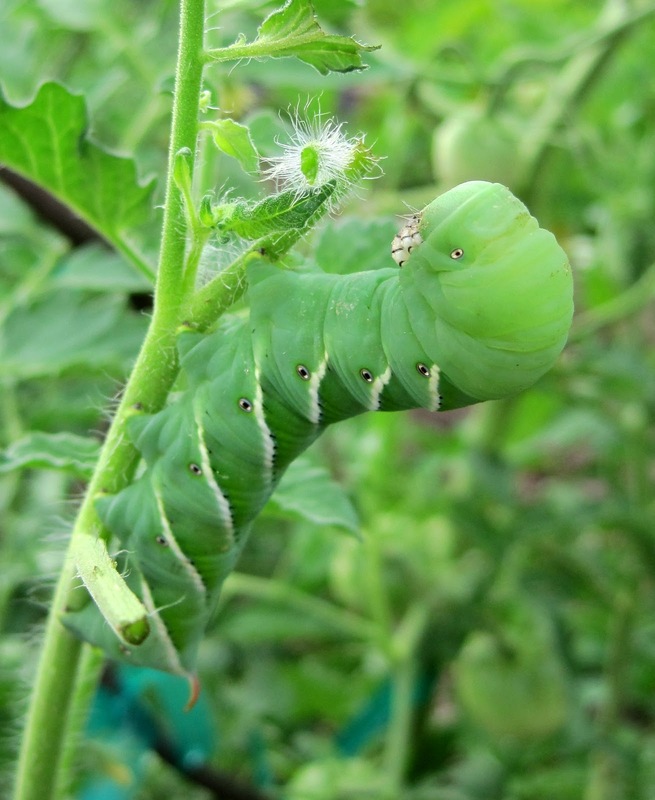 I would assume they use big ol' fat caterpillars because if you've ever seen a big ol' fat tomato hornworm on your tomato plants you know that they can produce a lot of frass. Frass! I hate the tomato hornworms. In my garden, I usually see their frass before I see the damage they've done to my tomatoes. Then I go looking for the actual hornworms, which are well-disguised and blend in. Follow the frass and you will find them. Collect the frass and you apparently have some good fertilizer. And what would you call the place where they gather all the insects to produce all this frass?A farm? A ranch? How about a squirm? Yes, I think the term for a large group of insects brought together to produce frass for fertilizer should be a squirm, for many reasons. I should have asked for a bag of insect frass for my birthday. 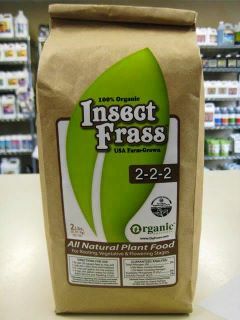 Somehow, I will get a bag of Insect Frass soon to try on my own plants, perhaps on the houseplants? Frass! Another rabbit hole of gardening exploration and experimentation. I wonder if it is silk worm frass? After all, to get silk you have to feed a lot of caterpillars a whole lot of mulberry leaves, and surely that results in massive quantities of frass... so why not sell it? Joseph, I think you are probably right. Someone probably shoveled all that silkworm frass onto their garden and noticed how well the plants grew and figured out that frass is great fertilizer. I do dump our silkworm frass in the compost pile here...but don't think we get enough to do much good. Guess every little bit helps though! Of course it's great fertilizer, after all they are eating healthy plants and recycling nitrogen! Must be some commercial insect business. Can't imagine what. Or are they using the wrong word. Whatever 2lb is a lot of frass. Carol, like you I have never heard of using insect poo as fertilizer. And, I agree with you. . . 'a squirm' is the perfect name for a place where two or more insects gather. I love it and must order a bag! Imagine my delight when I see your post headline. Of course you would see the ultimate irony of using insect frass in the garden. The frass is from beetles raised for reptiles. You can buy the beetles at pet stores to feed your pet reptiles that like that sort of thing. The frass was a previously unused by-product. It has some natural pesticide qualities that interest me. Carol, I am going to send you a package to try. E-mail me with your address. If your like it, perhaps your readers might also. The thought of insect frass is a hoot. It is probably good stuff, but still funny.